Here at our Gaithersburg/Rockville Chiropractic Clinic, we deal with the effects of whiplash and other vehicular accident injuries on a daily basis. We’ve put together a list of 5 little-known facts about whiplash to help educate our patients about their condition. Even though neck and/or shoulder pain are the most common symptoms associated with a whiplash-type injury, you may develop other symptoms such as headache, swelling in the neck, muscle spasms, numbness or tingling sensations down your arms, feelings of nausea, difficulty swallowing, dizziness, and/or blurry vision. Your symptoms may start immediately after an accident or they could slowly develop over hours, days, or even weeks. Most people wouldn’t believe you could be injured at such slow speeds, but you may be surprised to know that researchers recently performed studies on low-speed rear-impact crash tests and concluded that nearly 29% of the people involved developed whiplash symptoms at speeds of only 2.5mph. It’s also been shown that an rear impact of just 10mph can induce up to 9 G’s of force in your neck. Always keep in mind, the speed of the crash doesn’t always correlate to the severity of injury your body could sustain. The vertebrae of the neck normally combine to form a curvature of about 35-to-45 degrees (referred to cervical lordosis). Studies have shown that during a rear-end collision the body is forced back into the seat and simultaneously moves upward. This causes your lower cervical vertebrae to hyper-extend while your upper cervical vertebrae flex forward. Conventional wisdom is that it’s during this time when injury occurs in the neck as your muscles, tendons, and ligaments are being strained to hold your vertebrae in place against external forces. Ergonomic advancements in automobile seat and headrest design have helped to reduce the number of traumatic head and neck injuries caused by rear-end crashes. 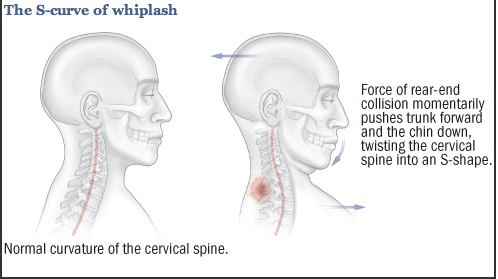 However, even when x-rays are negative for fractures of the cervical spine, a condition that commonly occurs with whiplash injuries is a straightening of the cervical spine’s curvature (decreased lordosis). This can be caused by chronic muscle spasm and is often accompanied by pain. If you’ve been involved in a car accident, have a trained chiropractic professional examine you and decide if X-rays are needed. 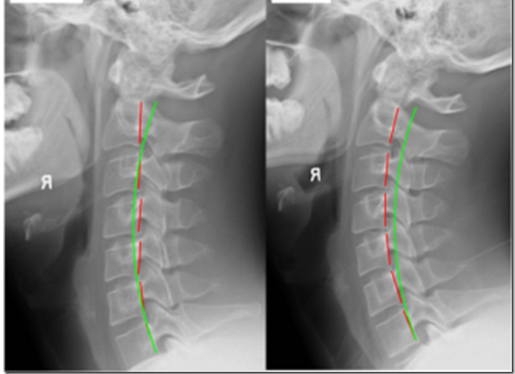 Above, on the right-side is an X-ray of a patient’s cervical spine showing normal cervical lordosis, whereas the X-ray on the left-hand side shows a decreased lordosis or a straightening of the cervical spine. Chiropractors are highly trained healthcare professionals and can diagnose and treat many of the injuries that are typically associated with whiplash. Here at our Gaithersburg/Rockville Chiropractic clinic, Dr. Davis will perform a thorough physical examination and compile a detailed history of your issues. Depending on your symptoms, he may order an X-ray, MRI, CT Scan, or other imaging tests he deems necessary to properly diagnose your condition. After getting to the bottom of what’s causing you discomfort, he’ll educate you on proper home exercises and/or stretches to help speed your recovery. Chiropractic treatment can last anywhere from a few weeks to a few months depending on the severity of your injury. And, of course, if it turns out you have a more serious condition that chiropractic care is not recommended or helpful, Dr. Davis has a large network of professional colleagues and specialists to which he can refer you for more advanced medical care. In the USA, over 1 million people suffer whiplash injuries every year, and roughly 10% of those develop chronic pain that affects them on a daily basis. If you or someone you know has been involved i an auto accident and is suffering as a result, get checked out here at our Gaithersburg/Rockville Chiropractic center. You simply don’t deserve to be in chronic pain. Call us at (301) 963-6700 and schedule your appointment today!